In the early 1970's we became interested in antique design and its' relationship to architectural styles selling antique furniture, lights and accessories . During this time we found our interests focusing on antique lights. We decided that the assortment of skills needed to properly place restored antique lights in renovated homes was a full-time endeavor. 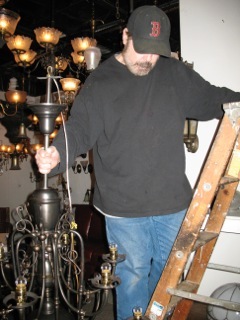 We have been exclusively restoring and selling Antique Lights since 1979. We have new arrivals coming in every week. 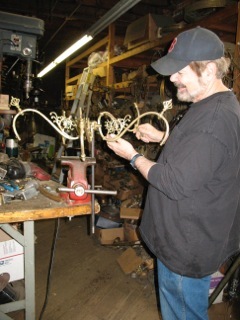 At Genuine Antique Lighting we try to inventory the lighting that was originally in the local architecture. Located in Boston’s historic South End, we have placed many antique lights in renovated Brownstones in the Back Bay and South End. We have also worked with customers who wanted to light rooms in renovated Victorians, Greek Revivals, Colonial Revivals, Arts and Crafts Bungalows and various other architectural styles throughout the United States. In our 3000 sq. ft. showroom/workshop, we display over 500 Antique Lights for your ceilings & walls or outside your home that date back from 1850 to 1950. Since being in business for well over three decades we have developed a considerable network of suppliers. We buy Antique & Vintage Lighting that sell to people who want their homes to feel comfortable and familiar. Our lights are for all rooms in your house, whether small or large, low or high ceilings. 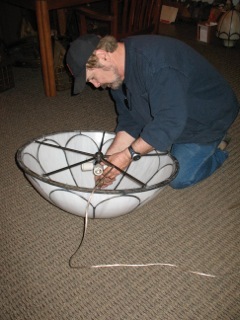 Our on-site restoration workshop allows us to sell beautiful antique & vintage lights for surprisingly low prices. We feel that the best customer is one that has been referred by another satisfied customer and has seen a well-placed antique light in their home. When the light works well within a home we have reached our goal. We feel our greatest strength is customer service. Take a look at our Reviews. Whether you are interested in an Inverted Dome from the early 1900’s in your foyer, or a converted Gas Chandelier from the late 1800’s in your dining room, we would like to help you find what you need. Our Entire Collection category are Antique Lights the we have in our showroom ready to be purchased. If you see a light that you like let us know. If you see something and aren’t sure, let us know for we might be able to help. Either way, E-mail or give us a call @617-275-4898.